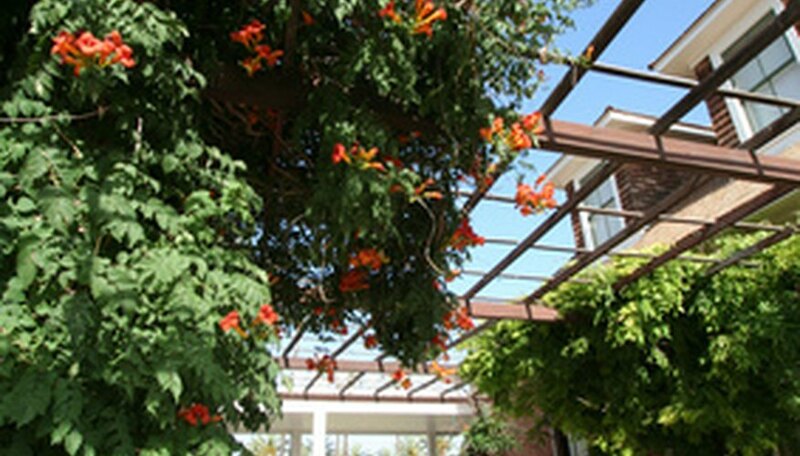 There are several flowering plants that are ideal for trellises. Most are flowers that grow to extreme heights and grow like vines. You can assist them in their efforts by careful pruning and training them in the direction you wish them to grow. Check the facts about the plant you wish to use and locate your trellis in the best location for good growth. The end result will be beautiful flowers that you can enjoy in your garden for years to come. Sweet peas have a lovely smell and wide range of petal colors. They grow fairly fast and can reach a height of 7 or more feet in a year. Set them on a trellis in full sun with rich, well-draining soil. Sweet peas do best if you provide them with fertilizer ever few weeks, or at the least once a month, and they will need lots of water. If you want continuous blooming, pull off dead blooms. The climbing rose is probably one of the most popular flowers to grow on a trellis, however they grow slowly. There are two types of climbing roses from which to choose. One grows flowers that only bloom once, and the other has flowers that bloom multiple times. To get climbing roses to grow on a trellis, help it along by tying new growth to the structure as it develops. These flowers need a well-draining soil and lots of sun. Get rid of dead leaves as they fall to prevent issues with mildew. Passion flowers have beautiful blooms of purple and white that can grow to 8 inches in diameter. They attract butterflies with their sweet odor and grow best in damp, rich soil. You can set these at a trellis that is in some shade as long as the flowers will have three or four hours of sun during the day. To encourage new growth, prune the plants back in the fall.